Interview with Brandi, our resident toy buyer. 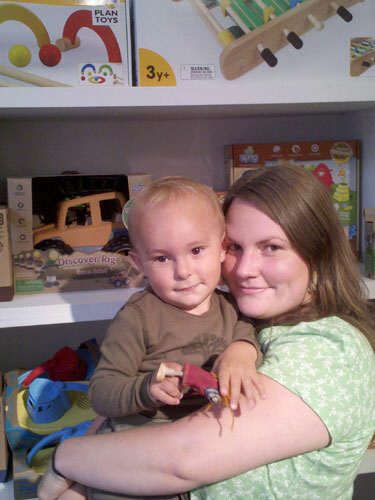 Brandi has been working with us for just over 3 years now, and has been the dedicated toy & book buyer. As a mother herself, Brandi has a wonderful eye for just the perfect thing! We thought it would be fun to learn a bit about her buying perspective and understand some of the reasoning behind what we sell at Fiddlesticks. Q: As the toy buyer for Fiddlesticks, what do you look for when buying? A: I'm always drawn to toys that I find beautiful, or unique in some way. I think its important when selecting toys to choose ones that instill creativity, and aren't limiting to the imagination. I also like toys that can grow with the child- and then be handed down. Q: What trends are you seeing with toys right now? A: I think that there is a real movement of parents wanting quality- over quantity- and lets face it less to pick up, right? Parents tend to want toys that can fulfill more then one need, so that the little ones can play with each toy in several ways. Dress up and art based toys are always in demand- and it seems that this is the one area where you can never have too much. Q: We see non-toxic & recycling being big messages across all aspects of our lives right now. In the toy business, more and more companies are changing their manufacturing process with this message being their core. What has been your experience with this? A: There are definitely more toy companys moving toward greener practices, and great new start up's that are actually taking products that were once considered waste and creating amazing toys out of it. It's really exciting to see the energy behind the green movement, and the amount of informed parents we get putting their beliefs into practice. However I find that with the current push towards green, many companies are guilty of "green washing" and trying to sell their toys under the pretense of being green when they are the furthest thing from it. I think as a consumer this can be really frustrating, because most parents don't have the time to thoroughly research each company they buy from, but as a toy buyer I find it essential to know what "green" means to each company we carry. Q: What is your favorite toy company right now and why? A: This is probably the hardest question yet...I'll give you three. I love Green Toys because they take our old milk jugs, and make really sturdy trucks and Tea Sets out of them. Also, their entire production is local, even the box is made here in the Bay Area. Their toys are imaginative and fun. I really want to see more from them. Maple Landmark makes beautiful wooden toys that can be ordered finished (with safe paint), or unpainted and un-varnished. Their company is truly sustainable- they even mail everything using recycled materials. Maple Landmarks' toys are all made in Vermont by hand. Their toys remind me of a simpler time, and are the type you would find in a Waldorf Classroom, or home. And third but definitely not least, Baby Leo. This San Francisco designer makes brilliant Super Hero Capes, and Mask & Cuff Sets (made exclusively for Fiddlesticks). The owner Mimi has local artists that work with her to create each cape one at a time. There is so much love that goes into these capes and they are actually hand delivered to our store- Amazing!!! And being that Mimi is a mom, she made sure that these beautiful capes can handle the dirtiest super hero and can be machine washed. Q: We find that buying gifts for the 6-8 year olds, or even a bit older can be challenging. What kinds of activities/ toys are you finding appropriate for that age group? And what would your top suggestions be for someone looking for a gift? A: It's funny because while children this age would probably still like a doll or truck- you better not be the person who suggests it. I find that this age group really wants the world to view them as "big" kids, so I like to get them toys that put them in control. Anything art based where the child is deciding what to create, or Science based and allowing them to discover how things work for themselves is always good. I also like the simple things that are overlooked like Jump Ropes, Bead Sets, Yo Yo's, and Spinning Tops. For someone wanting to buy something for this age group I'd look at the Tedco Science Kits, or The Little Experience Art Kits - they're both quite special. Q: As a mother of a little boy, you too are on the frequent children's birthday party circuit! What is your go-to birthday gift right now? A: For the younger one's I like the Stir Fry set by Melissa and Doug, and Plan Toy's slicing fruits set. For the older kids I really like The Little Experience sewing kits, and Tedco's Dinosaur Excavating Kit. And I might have already mentioned this but Baby Leo Capes. I also really liking pairing Green Toy's Recycling Truck with the book "Trucks Go" or "I Stink" two favorites around my house. Q: What toys have you found are hard to keep in stock because they sell through so quickly? I place huge reorders on Maileg Rattles every week, and no matter how much I order we are always dangerously low come every Monday. The Little Experience mini kits where you get to make a Steam Boat, Mini Rocket Ship, Daisy Chain, or Flower Head Band never stay on the shelves for long. The Green Toys Dump Truck, and the Dolphin Explorer from Sprig all seem to be impossible to keep in stock.